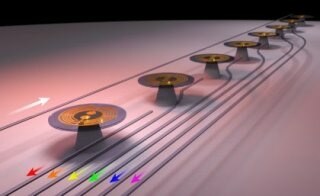 Researchers at The University of Queensland (UQ) are developing quantum sensors that could transform navigation and communications in autonomous and unmanned vehicles. UQ scientists are partnering with the Australian Defense Force (ADF), NASA, Orica Ltd, and Brisbane’s Skyborne Technologies to design the next-generation sensors as part of a $6.6 million Australian initiative to create quantum technologies for employment in defense applications. UQ scientist Professor Warwick Bowen said the study could place Australia as a world-leader in ultraprecise sensors for autonomous and unmanned vehicles. This is an exciting new direction, applying quantum physics to major challenges in modern technology. Quantum sensors allow greatly improved performance and could transform navigation and positioning capabilities for unmanned vehicles. These sensors will be so precise that the laws of quantum physics are required to understand how they function. And they’ll be built from both nanoengineered mechanical devices fabricated on a silicon chip, and atomic gases cooled until they behave as matter waves. The study is part of the recently developed Australia-wide Quantum Technologies Research Network, arranged under the Next Generation Technologies Fund. UQ has been given two projects to concentrate on advancing sonar, quantum accelerometers, gyroscopes, and magnetometers, with total funding of $1.7 million. Professor Halina Rubinsztein-Dunlop said the partnerships with the Australian Defense Force and other collaborators were crucial to the success of the research. The Next Generation Technologies Fund has been set up under the Defense Science and Technology Group, whose aim is to use science and technology to keep Australia safe. The sponsored projects will also enlist the expertise of UQ quantum physics scientists Dr Mark Baker and Dr Michael Bromley.